In partnership with Kopernik, HRF delivered 200 self-charging solar lights to the most vulnerable households in Aqaba. 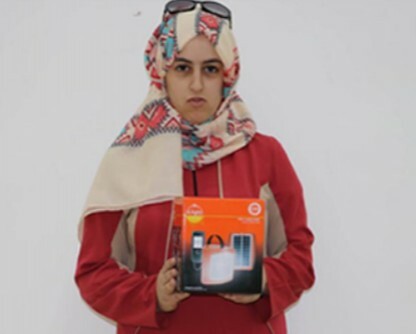 In partnership with Kopernik, HRF delivered 200 self-charging solar lights to the most vulnerable households in Aqaba. In addition to providing light, the solar lights can be used to charge portable electronic devices, including smartphones. This helped to reduce the beneficiaries’ electricity costs and at the same time allow refugees to stay connected with their family and friends. Finding a reliable, flexible and affordable source of electricity for refugees has had dramatic implications on their living situation. 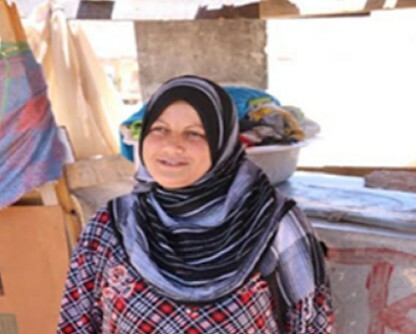 Anwar and her family have lived in Aqaba for nearly 3 years. There are six people in the family, and Anwar has a son who is sick with liver disease and her 3 other children to look after. Anwar’s husband is always out during the day trying to trade the clothes that Anwar knits. Anwar and the family live in a small hut in Aqaba. She washes clothes for food during the day, but this means the children lose out on their parents helping to teach them. Anwar tells us how she would like to spend more time on an evening knitting, so her husband has more clothes to sell. This way she can spend the day time teaching her kids and tending to her ill son, rather than washing other people’s clothes for a living. She speaks of how with an income they might one day be able to move into proper accommodation, and that way her son’s health might improve. Anwar now uses her solar lamp for knitting and teaching her daughter Jakia (8), to also knit, in the hope that one day they can set up a small shop. Her husband is selling more clothing every day, and the family is saving towards moving to better accommodation. Anwar’s sick son is receiving medication for liver treatment from a local dispensary, and this has seen a vast improvement on the rest of the family’s lives, not only her son’s. Abir, is a teenager, she left Syria at 13, and at 17 has lived most of her teenage years in Aqaba. She lives with her grandparents, mother and two other siblings. Being the oldest of her brother and sister, and the most able-bodied, it is up to Abir to take care of the family. She helps sell bread on the street when workers head home on a night, but has recently stopped after being told it is unsafe in the dark. Abir shared various stories about how when she was growing up she would always dress as a baker, and that now she feels she must use her passion to help generate an income for her family. “The streets are normally very dark,” she tells us, “and sometimes you hear screams, I don’t want to sell bread with my friend in the dark anymore as it frightens me.” Abir used to make enough money for all of her family’s basic needs, and electricity, each month, but now she can’t even pay for the electricity. It has been a month since Abir sold any bread. For Abir the solar lamps have allowed her to generate an income. Each night her safety is secured in the knowledge that she is not working without light, and can feel comfortable walking home after selling her bread. 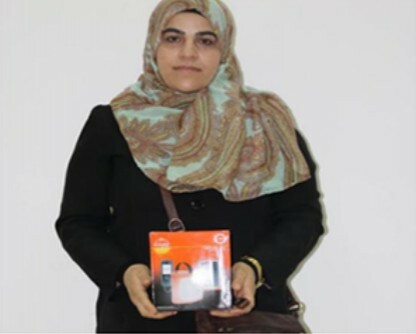 The DS300 solar lamp allows Abir to charge her mobile, so in the event of an emergency she can contact someone. In 2012, Hamar Ibdiyar, arrived into Jordan with her husband and their 3 children. They travelled to Aqaba by foot, car and bus. Hamar’s husband has failing eyesight, due to a cataract forming in one eye. They all live together in one room, the lighting is poor and they cannot afford the electricity bills each month. This means evening activities for work or study are compromised. Hamar’s husband used to be an engineer, however due to the cost of surgery, he cannot afford it, nor can he save up for the surgery as he was the main earner within the household. Each day Hamar and her husband help other members of the community in exchange for clothing and food, although there is not much security in trading like this. With their 3 children, who are all still young, they feel the pressure to make sure they are all educated. Having the solar lamps has meant Hamar’s husband is able fix various electronic devices for money each month, and also spends time teaching the children on evenings. Hamar can safely walk with the children at dusk to collect food vouchers when they are available, without feeling nervous about it getting dark with no lighting. With her husband’s newly found income she can now pay the electricity bills each month.